I just spent the past weekend at Mystic Seaport in Connecticut helping Clint Chase Boatbuilder assemble three Echo Bay Dory Skiffs for a Family Boatbuilding event at the 20th annual WoodenBoat Magazine Boat Show! It was a great event, lots of great boats, lots of great people, and despite some threatening moments, great weather. I had a fantastic time, it was not only a good learning opportunity, it was also a boat droolfest. Let's start somewhere important and logical: Paul from Connecticut's beautifully finished Goat Island Skiff! Baloney, I forget the name... Elizabeth Anne? Maybe Paul can chime and remind me. ***KATHLEEN MARIE*** thanks to Dave in NJ! Anyway, beautiful varnish work with a jet-black exterior. This is the real deal. The boat is ready to row, and Paul is still working on the spars, but to say the boat is striking is an understatement! Nice job Paul! This was not the only Goat Island Skiff in attendance, Clint Chase Boatbuilder's perpetually unfinished Goat was also on display, near our Family Boatbuilding tent. (I'd like to make it clear that this is Clint's personal Goat, unfinished as he is quite busy on his business end and customers take priority!) These two boat generated significant interest from spectators, and there were enough Mik Storer aficionados on hand to answer questions and get people stoked. 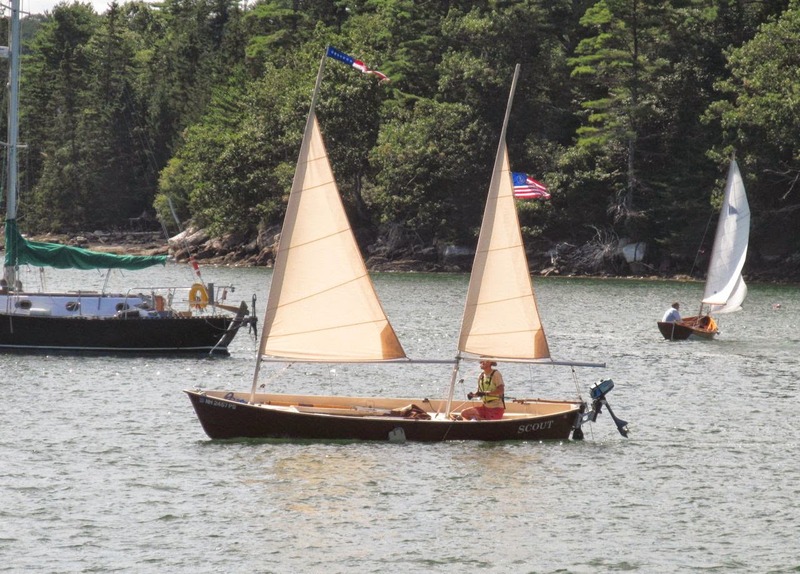 The Goat Island Skiff is entering the sailing world's consciousness. I love it. I love it. Preach it! In a similar vein to the Goat Island Skiff I found this sharpie (trying to figure out what kind of sharpie it is, ideas? Mik told me, I forgot) wedged between two buildings. Plumb bow, hard chine, flat bottom, and a massive centerboard. Massive. Mik Storer had some great things to say about huge centerboards and how many have strayed to small boards because "there's some crazy number floating on the internet on how big a centerboard needs to be and it's completely wrong." Beautiful boat. My rudder stock is lacking, in comparison. I need some protective demons! The best part of this launch is that it's SILENT. Steam is silent. Silence is beautiful. It could look like a turd, and if it's silent I would love it. Below is B & B Yacht Design's Amanda/Mandy which was a cutie and another crowd pleaser. It had a great solution to keeping the board down, the bungee through a piece of rubber hose, and it worked well. I'm always looking for good ways to keep my board down and this looks like a very viable solution. Finally, no visit to Mystic Seaport is complete with checking out the Charles W Morgan, America's last wooden Whaling Ship. She's on the hard for a real restoration, and she blocks out the sky. I haven't seen her in years. And finally most importantly, most epic-ly, I present the defining moment of the Show. Intrepid readers, I present to you your Intrepid Author-Hero and Michael Storer mugging for the paparazzi (my arm). HUZZAH! Oh yeah! There was obviously much much more to the show, this is but a small representation. Part 2 to follow with Family Boatbuilding! I like to think of my "perpentually unfinished Goat" as a perpetual show boat to sell awesome kits! If people see all the putty a pro uses, they me be more willing to jump in and go for it! Paul's boat is named "Kathleen Marie." I happened to capture a portion of his fact sheet in one of my photos! SOMEONE's paying attention! Hooray davlafont-- Intrepid Reader of the Week! You get special parking in the Amateur lot this week. Sailing/Camping Season Begins! Squam Lake.